Christmas Eve in Naples is all about fish and lots of it. While this whole concept of seven fish seems to be distinctly and Italian American thing, we do eat fish in its myriad forms on Christmas Eve. The logic for this being that we should be abstaining from meat to recall the birth of Jesus. Obviously gavaging ourselves with 15 kilos of seafood should really do the trick. The most common dishes on Christmas Eve often include antipasti of marinated and fried fish, kelp fritter and maybe just a touch of good mozzarella (Although not all on the same plate. Fish + Cheese = BAD in Italy). For primi we often have Spaghetti all Vongole (Spaghetti with Clams) or Risotto al Pescatore (Seafood Risotto). For main dishes or secondi, we enjoy fish both baked and fried. Generally we bake Orata, Brazino or Spigola (Sea Bass) aqua pazza style with tomatoes, parsley, garlic and olive oil. And then comes the fried fish. After soaking salt cod for days, we pat, flour and deep fry. There is also EEL or capitone! Big fat snaky eels that we buy live and kill at home before breading and deep frying. I actually like the capitone. Anything tastes good fried. But I absolutely cannot deal with bringing these sea snakes home alive only to have them flail around in the kitchen and then behead them! I guess I shouldn't have sent my witchy mother-in-law off to live at the convalescent home after all. Something tells me she would have been very keen to kill live eels before frying them in her cauldron. 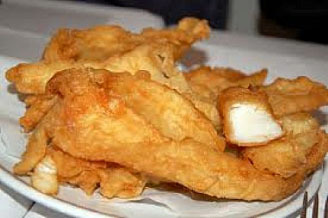 Here is the fried cod recipe for all of you wussies out there.